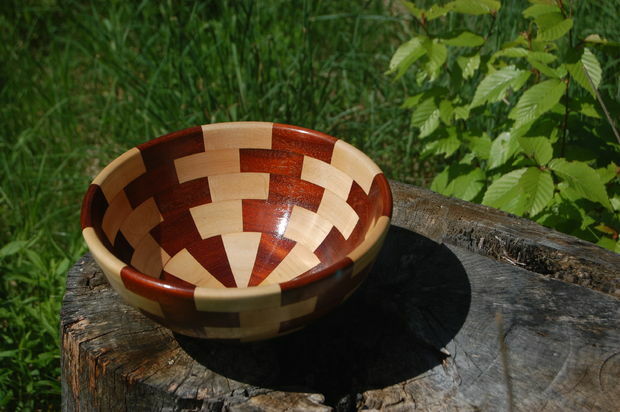 Rob created an Instructable for turning a segmented wooden bowl. You can see it here to learn more about the lengthy process of creating beautiful segmented bowls. The bowl featured in the Instructable was made with salvaged wood from old projects and furniture. It uses cherry and maple for the contrast, but you can use almost any hardwoods. It helps to pick woods of similar hardness, so when you sand them, one won’t wear down faster than the other. The bowl blank is built from segments of cherry and maple glued together. This provides two benefits over turning a bowl from a solid blank. First, there’s less waste because the blank will already be hollow, and roughly the dimensions of the final bowl. Second, when turning, you’re nearly always cutting with the grain of the wood, rather than across it. (The exception is the disk at the bottom.) This reduces tearing, wear on the tools, and makes mounds of those shaving ribbons that are so satisfying to watch fountain off the work-piece and pile up on the floor. This bowl has been sold, but there is a lovely maple segmented bowl here. Visit our Etsy shop for more of Rob’s woodworking.